In case you missed it yesterday, Apple had a few new products to share with you yesterday. As usual, the company continues to just crush it and will be providing you with new and more productive ways to leverage and use all of the Apple technology that you have. 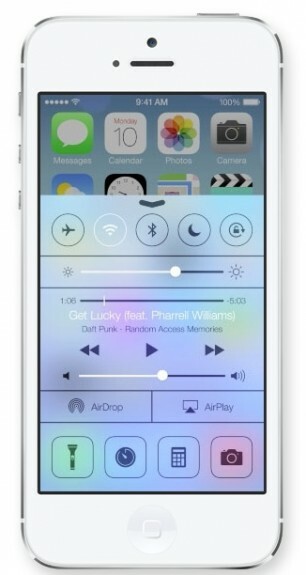 Apple announced a major iOS 7 redesign, with countless iOS 7 features that are rolling out in the iOS 7 beta today. They are also going directly after Pandora with their new iRadio service and killed a few competitive apps by just including these capabilities in the operating system, like the flashlight. So in case you missed the announcements yesterday, here are a few nuggets for you. Change is good. But remember, as Woodrow Wilson once said “If you want to make enemies, try to change something.” So this will identify the positives around the announcements. Someone else can write about what they hate about Apple. Not me. Control Center – In iOS 7 Apple adds a Control Center, which allows users to swipe up from the bottom of any screen for access to toggling WiFi, Do Not Disturb, Brightness, controlling music playback, AirPlay and more. There’s also a flashlight built-in and shortcuts to apps. Swipe to Go Back – When in Safari or other apps, if you need to go back, don’t bother looking for the back button, swiping in from the left will go back. Scrolling App Folders – The new app folders in iOS 7 aren’t limited to a few apps. If you want to put all your games into a folder you can now do that and scroll through apps in a folder. Better Sharing Menu – The new iOS 7 sharing menu includes a scrollable list of apps and other iPhones to make sharing photos and more simpler. Great New Look – Apple changed the look of IOS, from the font and dock up to the status bar at the top of the iPhone. This is a brand new look that many users are already excited to try out. New Multitasking With Previews – The new iOS 7 multitasking uses the full size of the iPhone 5 display to let users see what’s going on in apps. Users can also swipe up to kill an app, instead of long pressing on it. Siri Voice Options – In iOS 7 Siri offers a new female voice and a male voice for the first time. More Control of iPhone with Siri – Siri can now control more of the iPhone. In the demo Siri on iOS 7 controlled brightness, returning calls and controlling iRadio. iOS 7 Looks Change to Match Your Background – When you change the background of the home screen, elements of the IOS system will change to match the colors. This includes the dialer and other parts of iOS 7. New Camera App – iOS 7 features a new Camera app that includes faster access to panorama, a new look and much more.